Michael’s Floor Covering is in partnership with Mohawk as a Mohawk Color Center Elite Dealer. Fabrica, Karastan, Masland, Kane, Shaw, and Unique Carpets, among others, are also showcased at Michael's, along with an impressive variety of hardwood, laminate, ceramic, and vinyl. We are committed to excellence in every way to ensure your absolute satisfaction from the selection of your flooring to the crafted installation. Allow your imagination to reach and remember Michael's will be there every step of the way! Browse our website, read our many reviews and then stop in and shop in our beautiful new showroom. 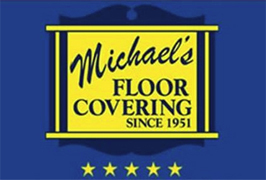 You will soon see for yourself why Michael’s Floor Covering is clearly the #1 choice for all of your flooring needs!